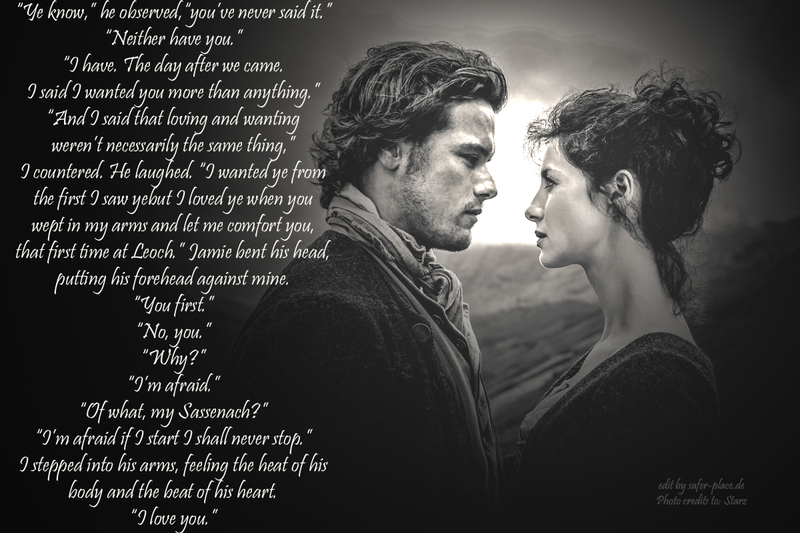 I laid my head on Jamie’s shoul­der and sighed. He squeezed me gen­tly in response. “Per­haps, Sasse­nach.” He looked out over the fields and build­ings, the crofts and the roads, then looked down, a smile sud­den­ly curv­ing the wide mouth. “I was born for you,” I said sim­ply, and held out my arms to him. “And I said that lov­ing and want­i­ng weren’t nec­es­sar­i­ly the same thing,” I coun­tered. The sun sank below the line of black pines, and the first stars of the evening came out. It was mid-Novem­ber, and the evening air was cold, though the days still kept fine. Stand­ing on the oppo­site side of the fence, Jamie bent his head, putting his fore­head against mine. “Of what, my Sasse­nach?” The dark­ness was rolling in over the fields, fill­ing the land and ris­ing up to meet the night. The light of the new cres­cent moon marked the ridges of brow and nose, cross­ing his face with light. He cast a glance at the hori­zon, where the sick­le moon hung low and ris­ing. “It’s near­ly win­ter, and the nights are long, mo duinne.” He leaned across the fence, reach­ing, and I stepped into his arms, feel­ing the heat of his body and the beat of his heart. You real­ly know your ‘edit­ing’! All are real­ly well done!